As an Adalet approved ATEX Control Panel Modification Partner we are able to provide populated assemblies for ATEX control using the XCEX series of control enclosures. 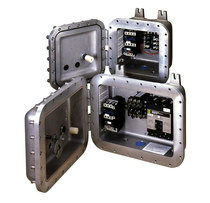 The XCEX empty enclosures are certified for IIB+H2 for ATEX applications and we can fully populate our control enclosures with any CE approved device and provide the engineering services required to certify your final assembly as an ATEX control panel with a complete ATEX Equipment Certificate. without additional third party testing and approvals. The IECEx system is an international conformity system where a mark of conformity will be granted by approved IECEx certifiers (ExCBs) located in IECEx participating countries for equipment that is covered by an IECEx Certificate of Conformity and hence has been tested and manufactured under systems that are under ongoing surveillance by ExCBs. It will help governments, safety regulators, and industry to have greater assurance that the equipment being operated or supplied for use in areas where flammable gases and vapors and combustible dusts (termed explosive atmospheres) are present, meet the world's most respected and vigorous safety standards. The IECEx mark is recognized by all participating countries and ensures that Adalet flameproof enclosures can be supplied without the need for additional testing. In 2016, Adalet received certification for an IECEx/ATEX Flameproof Control Panel Assembly. This allows Adalet to supply custom, fully populated CE-marked enclosures which are Exd Zone-certified under an EQUIPMENT Certificate. This is a turn-key solution that eliminates the requirement for customers to resubmit enclosures having only a Component Certificate for 3rd-party testing. The control panel arrives from Adalet pre-certified and bearing the CE mark, thus saving customers considerable time and money. Contact a sales representative at 800.739.9145 to discuss how to begin your IECEx/ATEX project.